We were greeted by a line of cabin stewards dressed very smartly in uniform and ready to assist. 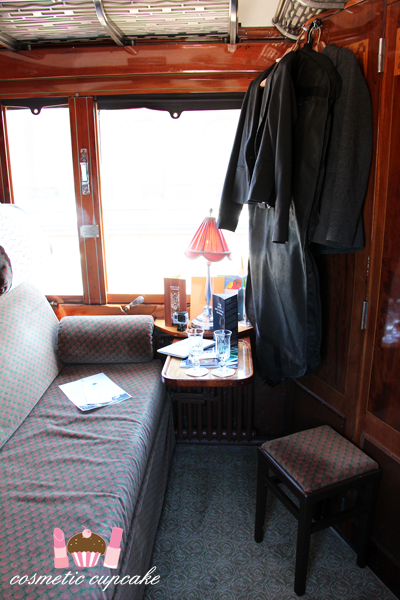 We located our cabin which was on carriage B cabin 1 at the start of the train stopping along the way for photos like the rest of the passengers. We were very warmly welcomed aboard by our cabin steward Thibault who was absolutely lovely and very helpful. 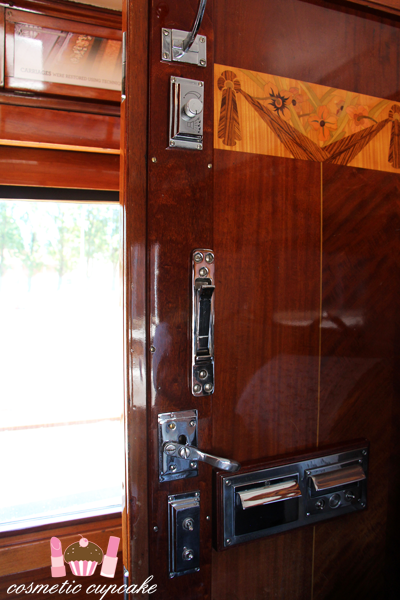 We stepped on board and finally got our first proper look at the interior of the train. Our hand luggage which we had checked in along with our outfits at the start of our journey had already been safely loaded onto the train ahead of time ready for us. 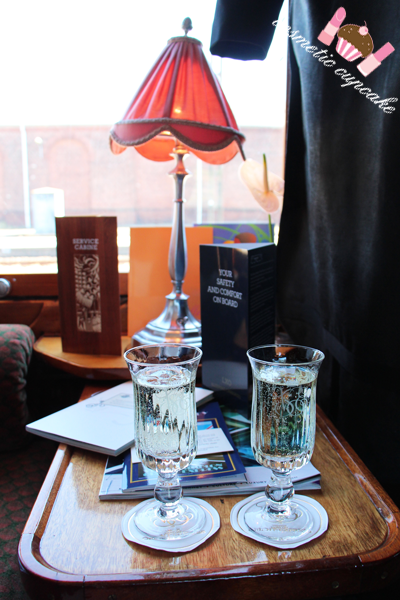 Thibault then came around with some bubbly and explained some housekeeping like how to turn the lights on and lock our cabin before leaving us to explore the train. 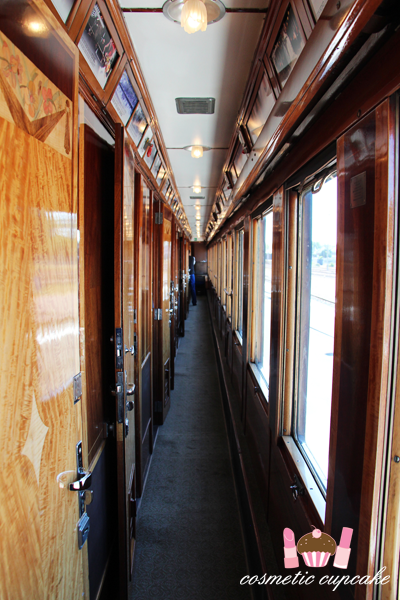 Expertly restored to it's 1920s glory, the carriages just like the British Pullman are breathtaking and simply beautiful. Absolutely amazing in their detail! 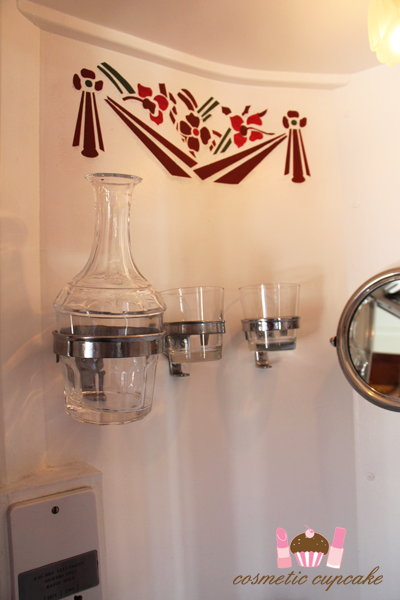 The cabins are definitely on the small size but fit 2 people and a small amount of luggage comfortably for a short stay. There's a small rackspace for about 2 carry on suitcases and hangers are provided too. 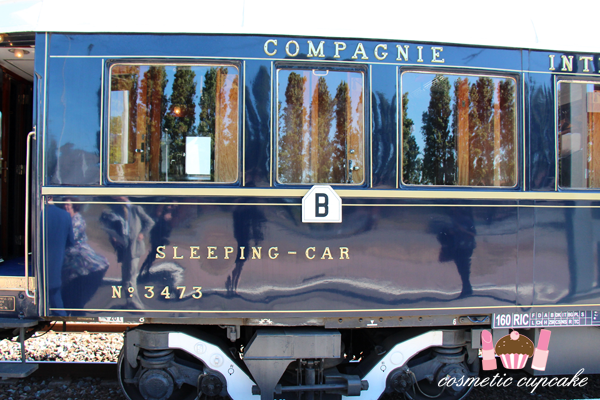 Because the train is from the 1920's it means that there's only a shared toilet at the end of each sleeping carriage - not so great if you're travelling more than 1 night really but it's all part of the experience! 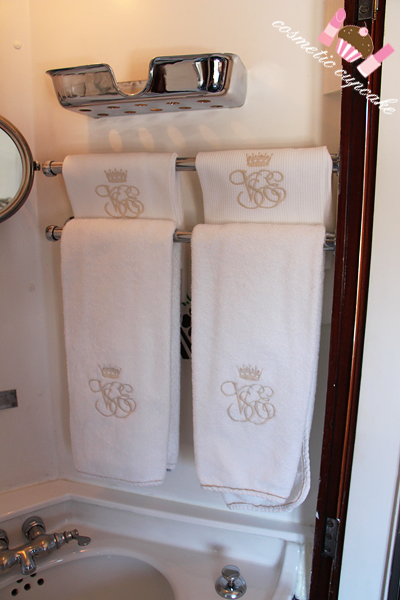 The toilets are large and clean and each cabin comes with a hand basin with monogrammed towels, toiletries and water. I am kicking myself because it turns out we could have taken home the little toiletries - they would have made a great souvenir! Next the train manager came and introduced himself and welcomed us aboard personally and congratulated us on our marriage and celebration which was a lovely touch. He gave us our dinner sitting and table number which was what I had been looking forward to for a very long time! 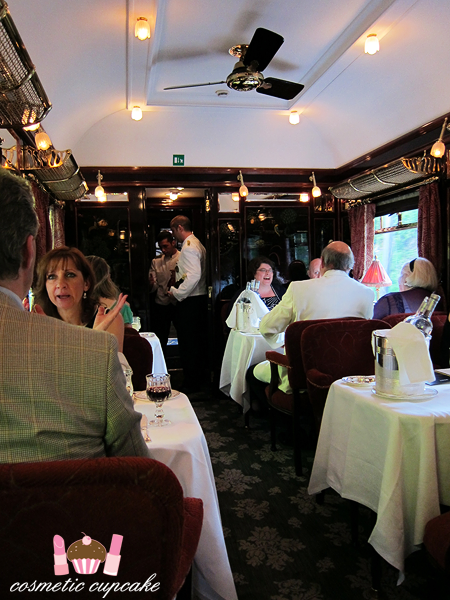 As there are a lot of passengers there are 2 sittings for dinner - one at 6:30 and 9:30pm. We had the 6:30 sitting as we were sadly departing the train in Paris and it was expected to reach Paris at approx 9:30pm that night. By the time we got settled it was nearly 6pm and time to prep in our finest for dinner. 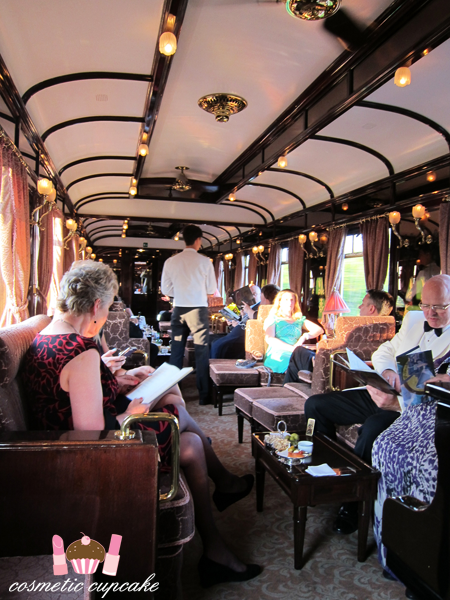 All passengers were reminded a number of times that dinner was a formal affair and that we were to be dressed appropriately. The travel journal clearly stated if passengers weren't dressed appropriately they could be asked to dine separately in their cabin! There was no way I was going to let the happen and choosing what to wear and how to accessorise was so difficult leading up to our departure. Let me tell you, it was no easy feat getting dolled up to the nines on a fast moving train with another person in a small cabin!! But it was all worth it as I absolutely love getting dressed up and especially for such very special occasion. It was lovely to see gentlemen in their tuxedos and ladies in their finest. I was disappointed to see that not too many ladies chose to dress in 1920s fashion but those that did wore beautiful dresses with sequins and lace. My dress is a super old dress from Review, shoes and necklace from Miss shop, and my headpiece and beaded hand accessory were from Lovisa. Lippie was Revlon Lip Butter in Cherry Tart! Now onto the absolutely hands down best meal ever that was our 3 course dinner. 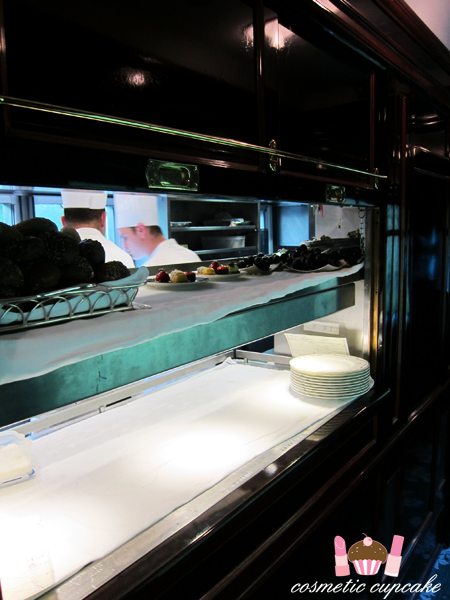 The train has 2 dining carriages and a bar car. 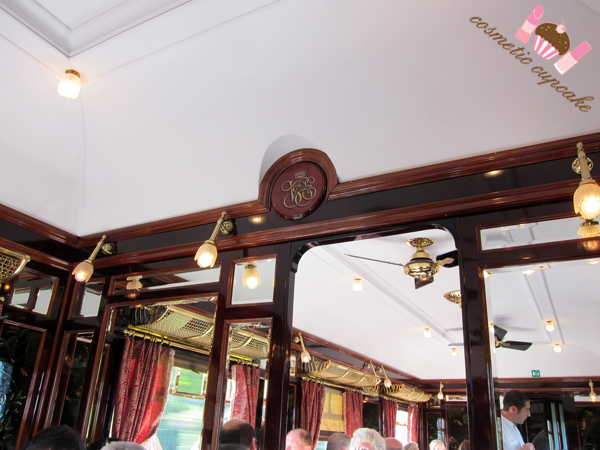 We got dressed in the nick of time and made our way to the dining carriage which was quite a few carriages away from us. I think it took at least 5 minutes to get there! 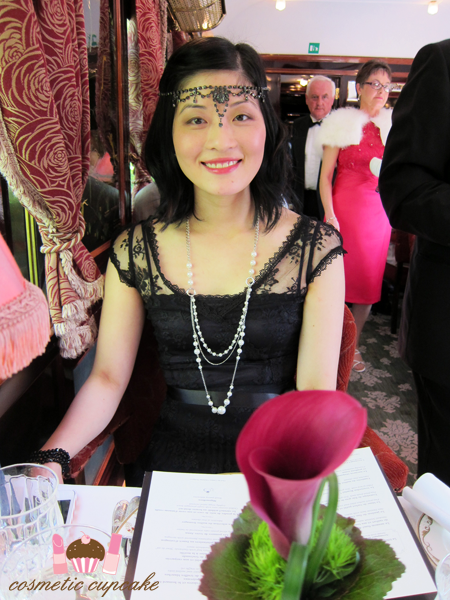 Our dining car was of course exquisite and wonderfully detailed consisting of tables of 2 and 4. We were lucky again to get a table for 2 and not have to share! 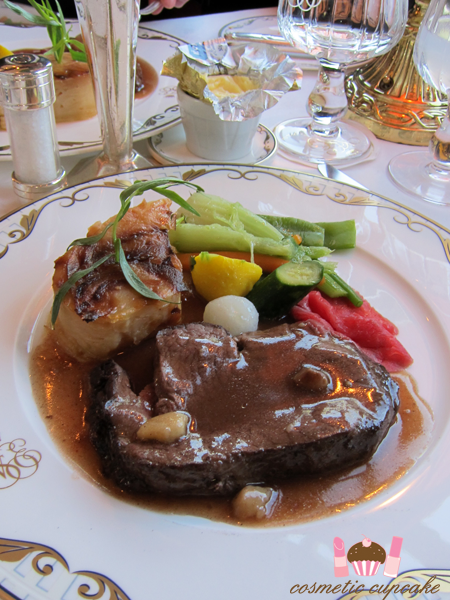 Dinner has a la carte and set menu options. 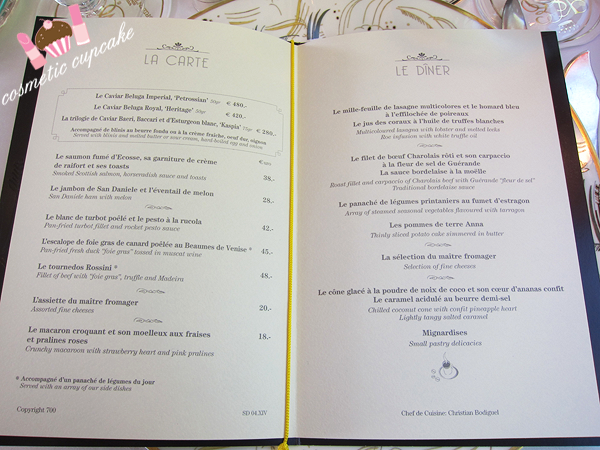 You might just be able to make out the items on the menu in the top left box which is Beluga caviar priced between a whopping €280 - €450. If only! 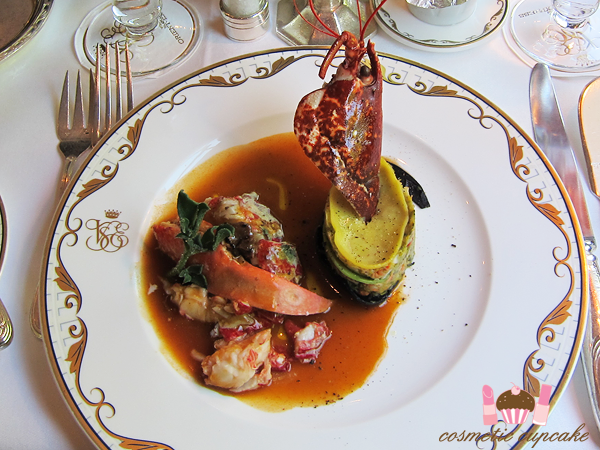 Our first course was multi-coloured lasagna with lobster and melted leeks; roe infusion and white truffle oil. IT WAS BEYOND WORDS. As soon as the plates hit our table the aroma of lobster and truffle just hit you and the sauce was the most flavoursome thing I've ever tasted I think. 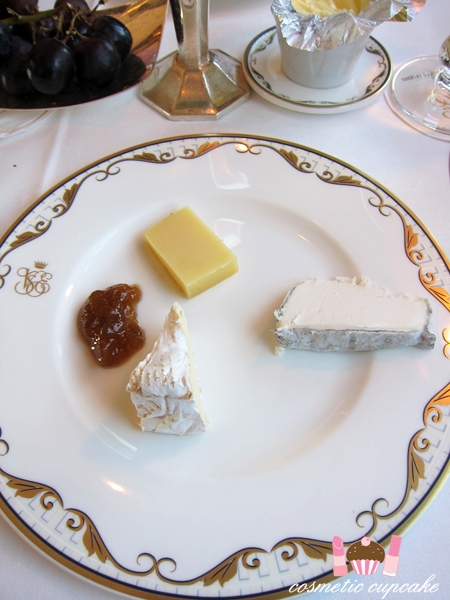 The hubby and I both very nearly licked our plates but obviously didn't! 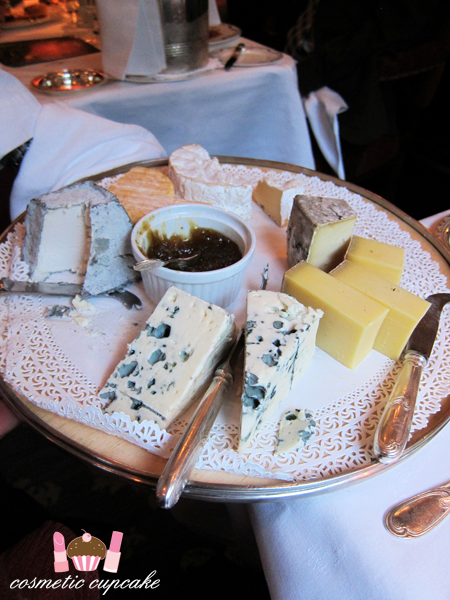 Next was a selection of cheeses and it was hard to choose what to have! Dessert was chilled coconut cone with confit pineapple heart and lightly tangy salted caramel. Very delicate and light and the perfect end to a wonderful dinner. 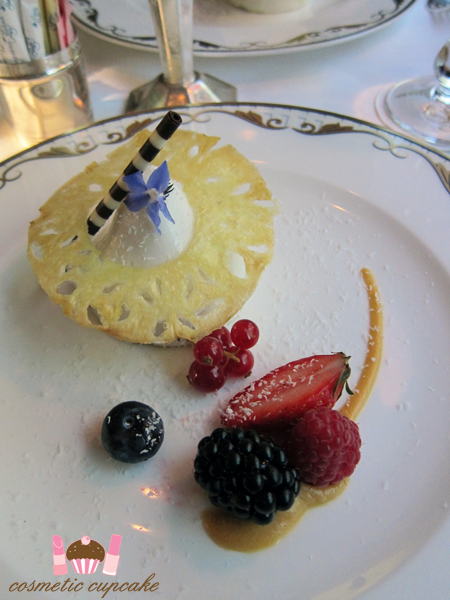 And that confit pineapple was just heaven! I could have eaten an entire bag of them.. 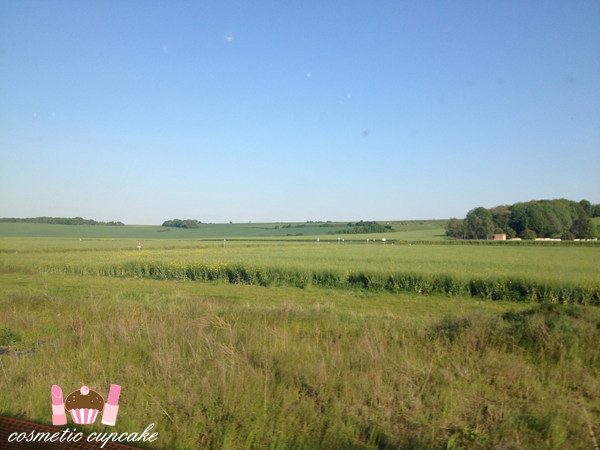 It was so enjoyable to sit back and enjoy the French countryside while having our meal. 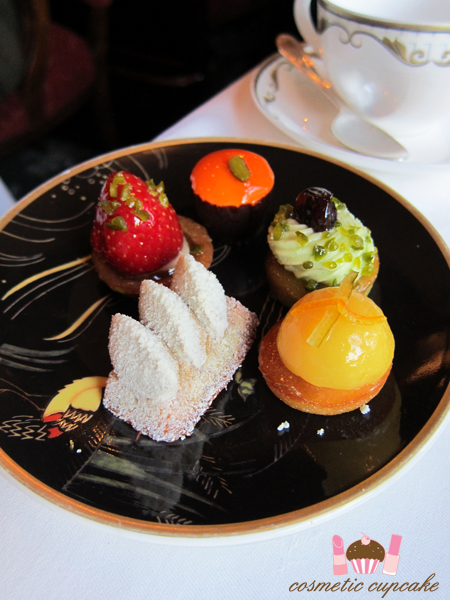 The meal was finished off with some cute petit fours and tea or coffee! The kitchen is headed by Head Chef Christian Bodiguel and the kitchen is TINY yet creates amazing meals for 200 passengers daily. 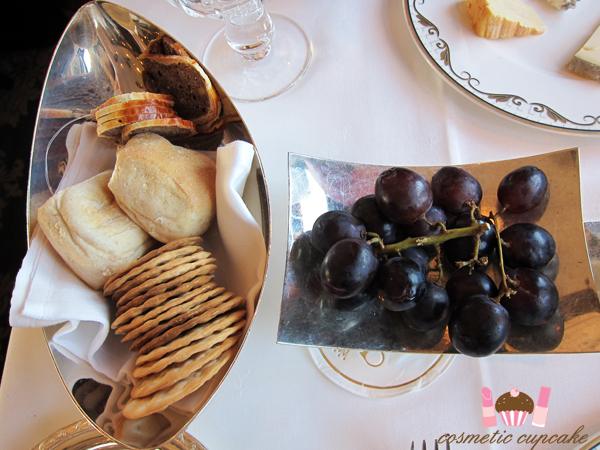 Christian walked through the dining car towards the end of the meal and we were able to say merci personally for such a memorable meal. Sadly we didn't get a photo with him though! I couldn't go on the VSOE without taking home a souvenir so after dinner we stopped by the "Signature Boutique". It was easy for me to decide what to take home though - it had to be a LE 2014 copy of Murder on the Orient Express that's exclusive to the VSOE. It's limited to only 1000 copies and specially produced for the VSOE. He said that it was the first copy he had sold this year which was exciting! 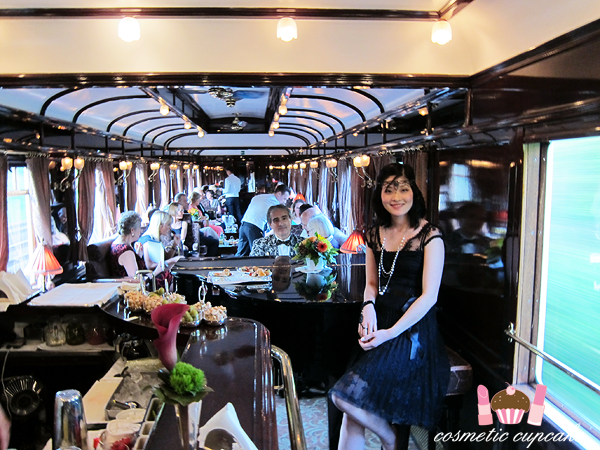 We then made our way back (more like rolled really) to our cabin stopping by the bar car to enjoy the piano. The train was SO rocky at this point that I practically fell very unladylike onto a couch while trying to take this photo haha! The stewards were still able to serve cocktails without spilling a drop which I found super impressive. 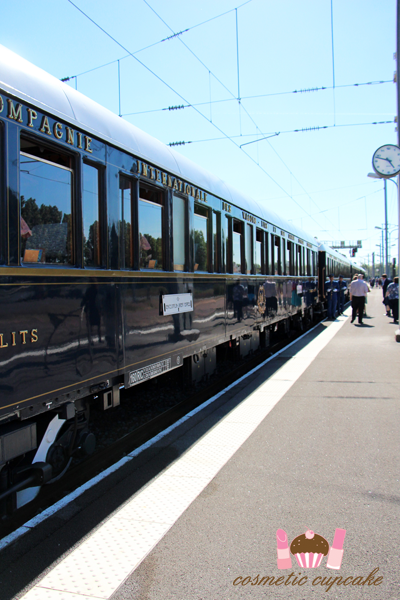 Unfortunately because were were disembarking in Paris we didn't get time to enjoy the bar car for a cocktail by head barman Walter. 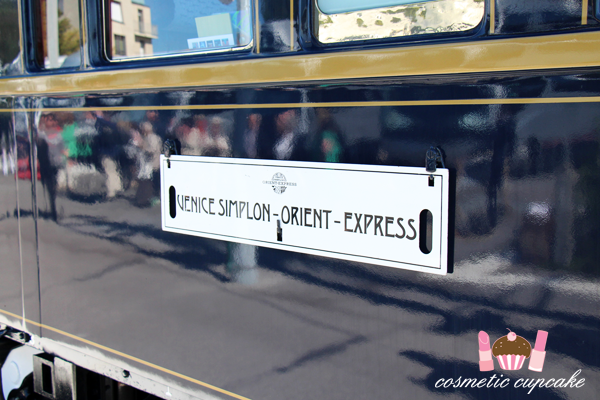 Unfortunately our trip on the Venice Simplon-Orient-Express came to an end all too soon. We arrived into Gare de L'est station in Paris at approximately 9:30pm just as it was getting dark and it was so romantic watching the sun set from the train. I felt unbelievably sad to leave the train and I really wish we had decided to travel on to Venice instead. From there we bid our lovely steward Thibault and the train farewell and caught a taxi to our hotel taking in the sights of Paris for the very first time. There was something very romantic and magical about traveling through the streets of Paris for the first time and seeing the Eiffel Tower and other amazing landmarks lit up at night. Price: The London to Paris trip set us back just over $1000 per person (2014 current price) for a one day trip. Meals are included in the price however drinks are not. Gratuities are at your discretion too. Was it worth it? YES. It was worth every. Single. Penny. It was without a doubt the highlight of our honeymoon and I am so happy we took the plunge and made the journey. 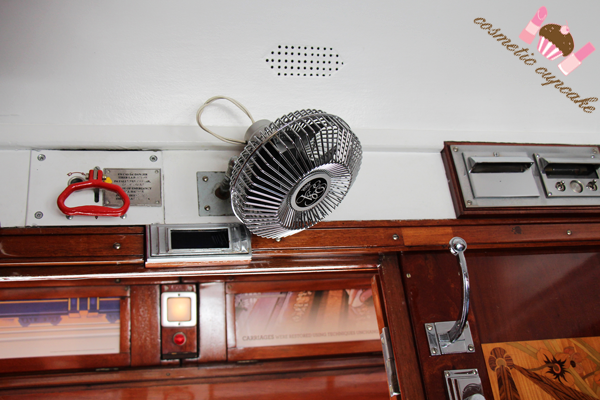 If you're an Agatha Christie fan or a train buff I cannot recommend it enough! A must do in your lifetime. Overall: The VSOE was an absolutely unforgettable experience. 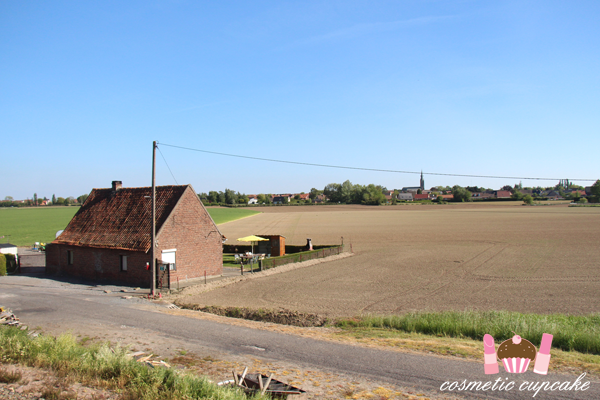 The luxury and history of the journey I simply can't put into words properly and something you literally have to experience yourself. 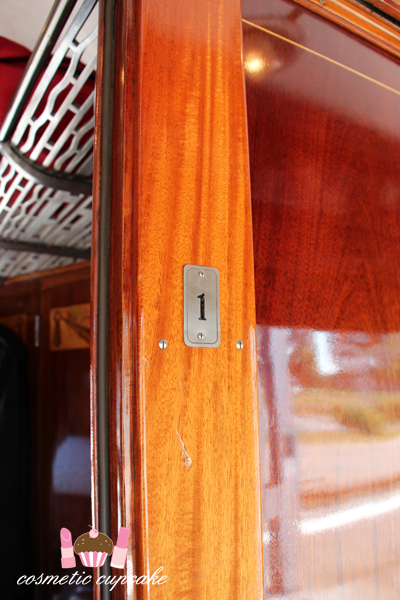 Everything that you've heard about the VSOE is absolutely true and it's without a doubt THE most romantic and glamorous way to travel. 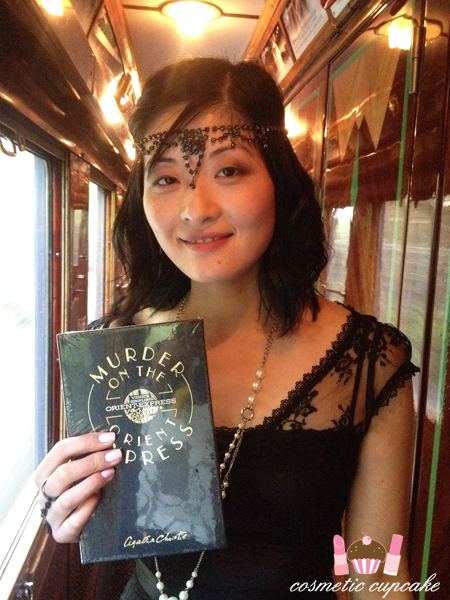 It exceeded all my expectations and even the hubby's and he's not an Agatha Christie fan. Everyone (bar the snooty lady) we met on the journey was so lovely and were celebrating a special occasion as well. 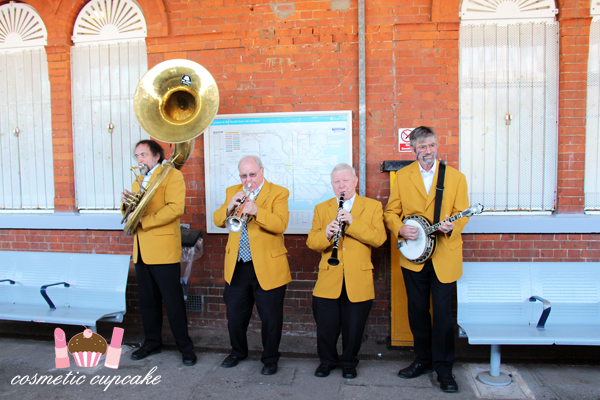 The atmosphere on the train was of pure excitement and it was fabulous being so warmly greeted by each person we passed on the train. I don't think I could wipe the smile off my face the entire trip! And actually I still can't and I still bang on about the train whenever I can to whoever will listen to me haha. Everything about the journey was simply magical. The service was above 5 star from start to finish - every single worker was discrete, professional, courteous but still friendly and very helpful. 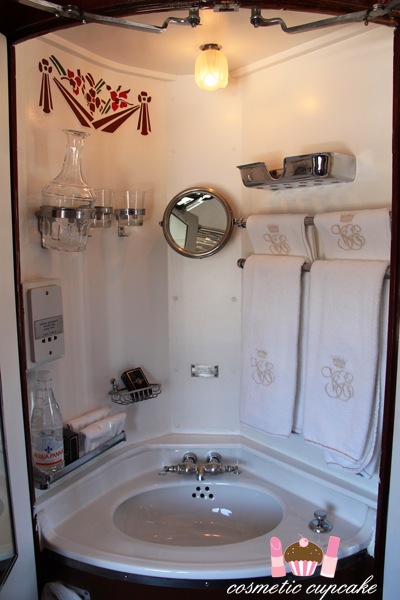 Exactly the sort of service you would expect from a 5 star hotel but on wheels and infinitely better. - Dress up! Smart casual for day meaning strictly no jeans or runners and black tie for the evening ie. tuxedos and gowns. There's no way you can be too overdressed and it all adds to the occasion. That goes for both men and women! - Don't be put off by the price. It's a special occasion experience and trust me - WORTH EVERY SINGLE PENNY. 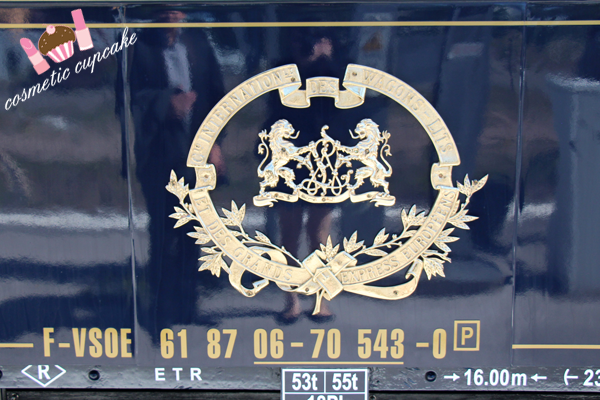 Details: To book head to the Belmond website for all the VSOE journeys in Europe. They also have journeys in other parts of the world including Asia and South America. 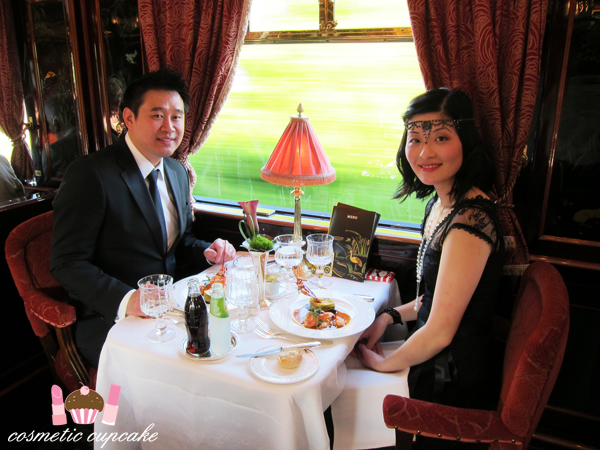 Part 1 of our honeymoon in London here and part 2 on the Belmond British Pullman here. If you made it to the end of this post thank you and I hope you enjoyed it! How fabulous! Love reading about your honeymoon, don't be scared to post more about it! Oh wow Chelle, more more more! Enjoying your honeymoon posts so much! 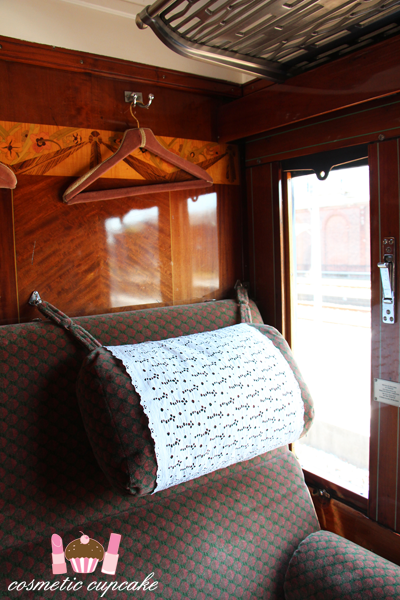 You've made it as if we're traveling the journey with you again :) The Orient Express experience looks completely beyond words & it goes without saying you looked STUNNING! 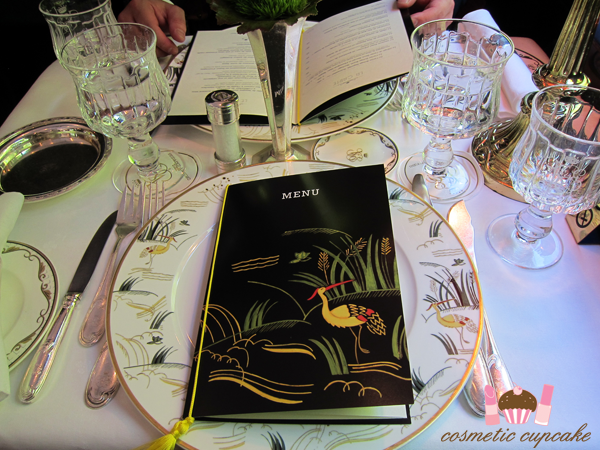 Loved the dress and headpiece & omg the food....*drools* That LE book is incredible! You are too kind hun!! It's taking me forever to go through my photos as I have so many haha. And then I get distracted when I go through them too! 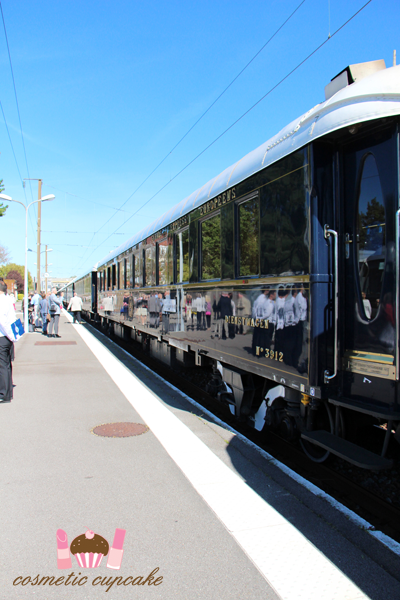 Oh man the Orient Express is something you really have to do. The food! The train! Everything! İ follow you please also follow me back !